A few years back, a friend and I did an old-fashioned New England "swop". He had broken one of his Irish cut glass brandy snifters. I had bought two just like it years earlier on eBay; I rarely used them. In exchange for my snifters, he gave me a bottle of their homemade red wine and a quart of homemade tomato sauce. Himself and I shared the wine a few years ago with my SIL and her hubby when they were over for dinner - it was good. I recently used the sauce for a pasta dinner - it was really delicious. I felt a special "thank you" was due to my friend. My plan was to fill the canning jar with homemade scones. I should have measured instead of eyeball the size. My big scones don't fit through the opening! I should have used my small scone pan instead. Well, they look nice in a gift bag. Two different batches of scones. The upper left is a basic cream scone with pieces of dried cherries. The lower right is orange-mini chocolate chips ( our favorite). Have you posted the scone recipes? They look wonderful. Thanks, msm. I haven't posted any recipes since they aren't my recipes. I have a little book called "Simply Scones" that I use for any scone I bake. However, they are all just basic 2-cup recipes. Just like a lot of other 2-cup scone recipes online. MY secret, though, is that I always add a bit more liquid than any of the recipes call for, and I always bake them in my Nordic Ware scone pan. I've made scones the standard way, cutting a circle into eight wedges on a baking sheet, and they didn't come out anywhere near as nice. I swear by my scone pans more than any recipe. I made something today, which was National Coffee Cake Day (not that I need an excuse to bake something!). And I doubt that many people, if any, have seen recipes for it, or made it before. 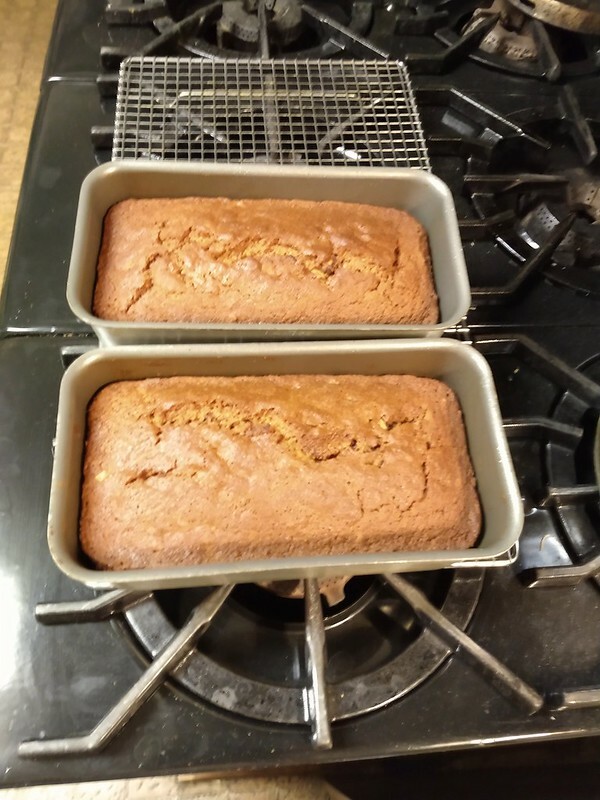 It is a pumpkin bread, which I made with butternut squash flour! I dehydrated a bunch of extra butternuts that I had, and ground them up into a fine flour in the VM. Each time that I dehydrated them, 1 lb reduced down to 1 oz, like tomatoes! I had only used the flour before in some butternut soups, as a thickener, and it worked well, but I had been thinking about this use since I made the flour. Here are the photos, and the recipe. 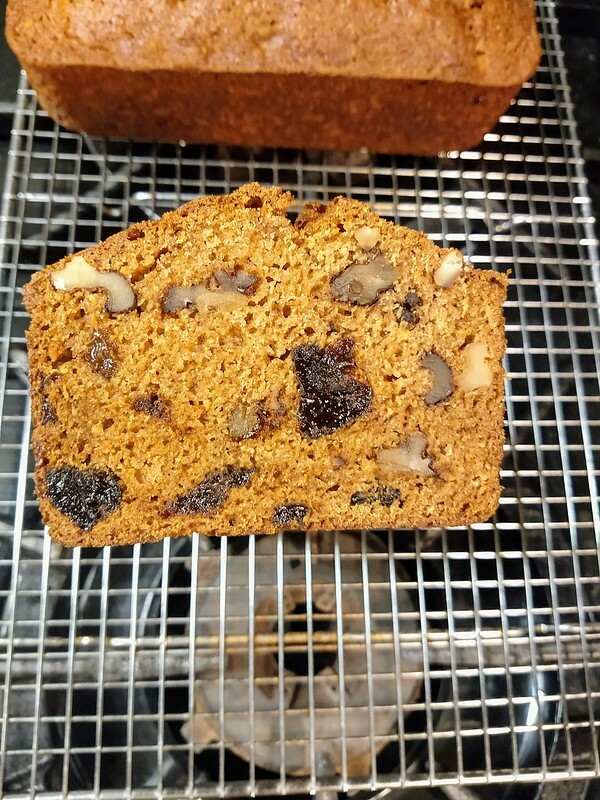 The original recipe had dates, rather than prunes, and pumpkin. 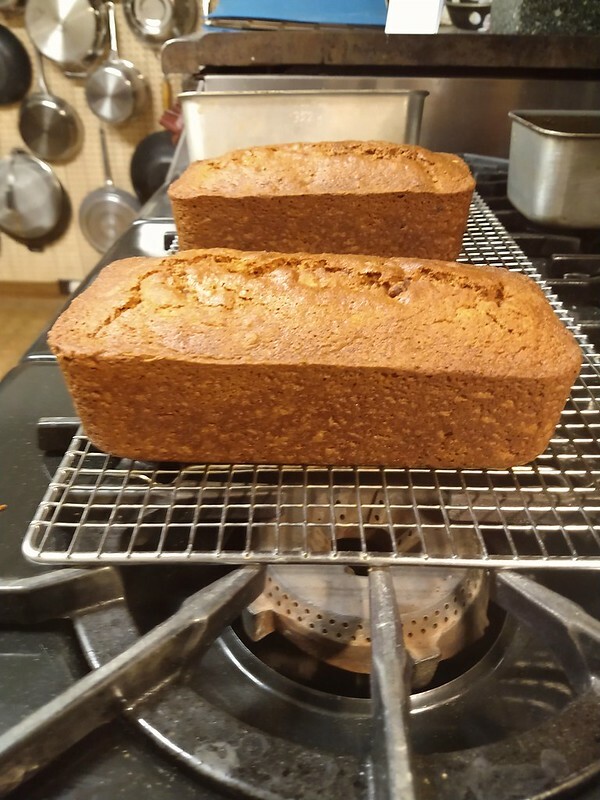 I used 2 oz oz butternut flour, and 14 oz water, but next time I'll use 13 oz water, as it was a bit thin this time, compared to using canned pumpkin. However, 1 lb of butternut dehydrates to 1 oz, so this was the equivalent of 2 lbs of butternut. A. Butter a 10 c loaf pan, or two 6 c pans, or any combo of smaller ones. Sift together the dry ingredients (I usually do this in the FP), and set aside. B. In mixer bowl beat the eggs and sugar briefly, then add the oil, followed by the pumpkin. 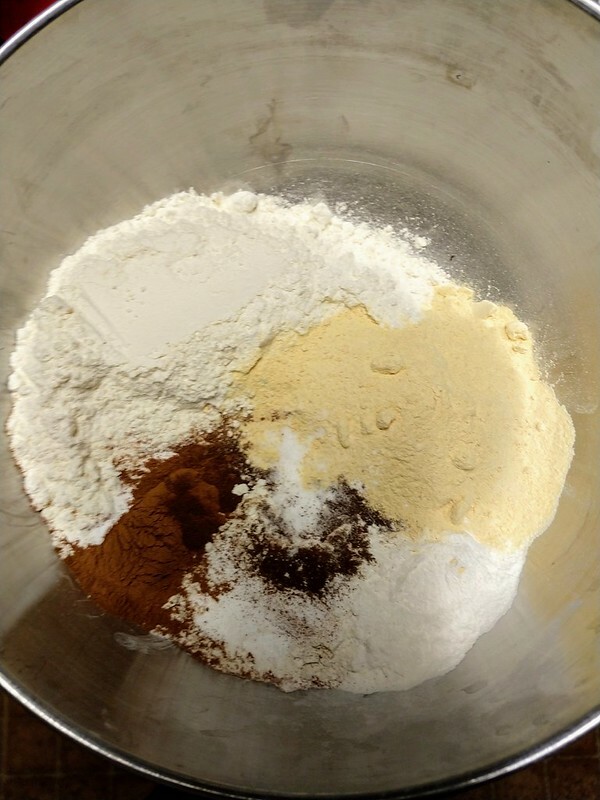 Add the dry ingredients on low, and beat just until flour is mixed in. Fold in the prunes and nuts, and turn into the pan(s). Set aside 15 min. while preheating the oven to 350º (or set in a cold convection oven, and set to 300º). C. Bake large loaf about 90 min., medium loaves about 70 min., and small loaves about 50 min., or until toothpick comes out clean. let cool in pan 15 min., then turn out onto rack to cool. Flavor improves with a couple days of storage, like all spice breads.